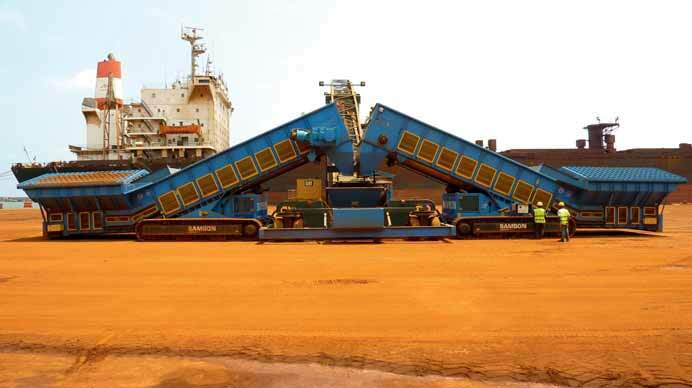 In Liberia, at the ArcelorMittal terminal, SAMSON has commissioned a new mobile shiploading system incorporating the company’s new range of crawler track-mounted material feeders. The mobile shiploader is based on the SAMSON cambered boom design established for many years and proven in over 100 applications worldwide. Using the cambered boom the shiploader discharge section remains near horizontal over the vessel, thus minimizing the material free fall into the vessel hold. At the same time, by minimizing the conveyor lift, power demand is correspondingly reduced making this design particularly energy-efficient by minimizing the required drive size, especially important with mobile equipment. Using a tapered fabricated boom, stress levels in the structure are relatively constant along the machine length to maximize the design efficiency whilst retaining the capability to support high head loads for such as ‘Cascade’ trimming chutes with rotating trimming distributors. Handling heavy mineral ores with densities over three tonnes per cubic metre places particularly stringent demands on the structural integrity of the shiploader construction and, in particular, the cantilevered section over the vessel. This is aggravated in many sub-tropical or monsoon areas where extreme rainfall — over 300mm per day — will turn normally free-flowing material into virtual slurry liable to bridge and block in chutes and trimming gear. To maintain the integrity of the shiploader boom, structural calculations must take into account a blocked chute condition and the maximum load level possible on the conveyor boom limited only by the material natural repose angle. In effect, this approximately doubles the distributed load on the shiploader boom and can easily more than double the head load from a blocked chute; clearly, the higher the material density, the greater the load and risk of catastrophic failure should these factors not be factored in at the design stage. With almost any design of trimming chute, there is a risk of material blockage. In addition, there is also the risk the chute may become buried in the material within the hold if the trimmer is not continually raised to keep the equipment clear. Of course, this is a double-edged sword when the raw material is dry and dusty, since the objective of the ‘Cascade’ or similar chute system is to mitigate dust generation by controlling the material free fall and limiting the material flow velocity; this control is lost if the free fall between the trimmer and the material is excessive. To control such risks, SAMSON uses safety devices to control the applied head load including load cells mounted between boom and trimmer, plus level detection at the trimmer discharge and within the chute to automatically control the boom raising with a backup in case the primary detector fails. These are complex issues and go to the core of the equipment design both in safety and operationally and form a key part of the SAMSON machine design philosophy ensuring safe and reliable operation in service under all working conditions. Of course, heavy mineral ores are only economically shipped in large vessels, Panamax size ships being typically the norm, even from smaller ports. This is illustrated here in Liberia at the port of Buchanan, operated by ArcelorMittal feeding ore from its mines inland using a refurbished rail link into the port. To bring the export facility on line with minimum delay, the operator decided to first install mobile loading equipment available on a relatively short lead time compared to a permanent fixed installation requiring stacker/reclaimer systems and a rail mounted shiploader. The mobile shiploader with integrated diesel gen-set requires no fixed systems or port infrastructure. When paired with the twin SAMSON tracked material feeders, each with on-board diesel motors, the complete equipment may operate autonomously. The ore is stored outside and transferred from the stacking area to the material feeders by a fleet of wheeled loaders to achieve a loading rate of 2,500tph (tonnes per hour), subject only to the loader travel distance. The ore may be dry and dusty outside the rainy season in the middle of the year, but generally it is wet and sometimes very wet and cohesive and liable to bridge and block in chutes and hoppers. Even in the dry season, monthly rainfall is 200mm ranging to 700mm in February and March. Therefore, stockpiles, unless protected, can be almost slurry-like, on the surface at least. Not only do the material characteristics directly impact on the shiploader design, they also impact on the design of transfer chutes, valley angles and wear liners and also on the design and operation of the associated feeder equipment. In this case, the decision to use the SAMSON material feeder ensured reliable operation handling even the most difficult materials thanks to the wide apron belt design. By placing the material feeder at 90° to the shiploader, the associated transfer chute may be very steep ensuring reliable flow to the ongoing conveyor belt. Also, the tracked travelling system ensures the equipment can move over rough and uneven ground, resulting from ore spillage in the loader operating zone, and may be quickly and easily repositioned without risk of getting bogged down. Similarly, the shiploader with powered travel and steering may move easily between holds for effective vessel trimming. By minimizing the time lost in manoeuvring the equipment, the total vessel-loading period may be reduced giving an effective increase in the ‘through-the-ship’ average loading rate. Clearly, it is the average loading rate that determines the total vessel loading period and therefore the cost per tonne loaded. With this equipment and efficient loading shovel operation an average rate of around 2,000tph is theoretically reasonable giving a daily (20 hour) rate of 40,000 tonnes which is equivalent to a vessel turnaround of two days providing all else is equal. Using a single feeder only,ArcelorMittal in Liberia achieves an average rate of 800tph in practical operation. SAMSON has delivered a number of mobile shiploaders in recent years to handle a range of mineral ores and concentrates including copper, gold, nickel and other similar commodities all of which share many common attributes including mainly high material density and high abrasively. Working locations from the Arctic to the Tropics with temperatures ranging from minus –40° to +40° challenge any equipment but with experience the equipment design may be tailored to the particular site demands and, most importantly, to the actual material handling characteristics. Whilst in this application in Liberia uses wheeled loaders to load to the shiploader from a quayside stockpile, in many applications the availability of material so close to the berth is a luxury and very often truck haulage is required between storage or processor and the berth. In this situation, the SAMSON material feeder is arranged for direct delivery by truck eliminating double handling at the berth and also eliminating any contamination of the quay by stored material. SAMSON pioneered the ‘truck-to-ship’ concept, incorporating twin or single Samson feeders integrated to the shiploader chassis allowing the equipment to operate as an autonomous whole. Of course, the mobile material feeder is not limited to operation in ports and may be equally applied in surface mining operations where a mobile feed point is required loading to an existing overland belt. This permits the best use of flexible short distance truck transfer and the economy of long-distance conveyor haulage, illustrated herein a Material Feeder within integral reject grill being transported by dozer between working locations. The established range of SAMSON’s products for minerals import and inland distribution are now complemented by a new range of standard ‘off-the-shelf’ products normally available from stock including telescopic stockpiling conveyors, Caterpillar track-mounted mobile link conveyor and stackers but most importantly a new range of ‘boom feeders’ with tracked undergear, integral feeder and radial boom. The boom feeder is a universal materials handling tool designed for stockpiling, barge loading, loading rail wagons and as an emergency feed point for yard belts during stacker/reclaimer rebuilds. High flexibility in operation and low cost per tonne loaded are clearly substantial benefits with mobile solutions at any point in the minerals logistics chain but also fast track availability is a clear critical benefit. SAMSON has invested heavily in new products and new designs aimed specifically at the mining section and in particular the feeding and ship loading or stockpiling of heavy mineral ores using predominately mobile solutions offering flexibility combined with performance and reliability.